Metrilo gives you a better way to track your eCommerce acquisition channels. 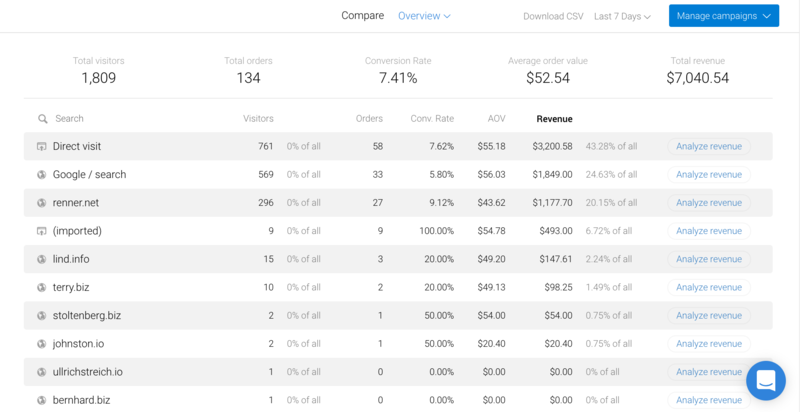 The Marketing Performance tab helps you make your eCommerce business even more profitable. Let’s start with an overview of how it looks and then we’ll go into details. It’s simple and straightforward. It works in real-time and makes lots of automatic calculations for you so you don’t have to. By default, it shows the aggregated data for the last 7 days, but you can change that from the period selector at the top right. First, you get a strip of global metrics for the selected period to take in at a glance. Then, there’s the table of all acquisition sources for your store. By default, Metrilo sorts your Traffic sources by revenue. You can click on any column header and change the sorting. Example: Wondering which traffic source has the best conversion rate? Just click on the “Conversion rate” column. Looking for a specific traffic source? There’s a search box - it serves as a column header for the first column on the left. Just start typing the source you're looking for and Metrilo will automatically display results in the table. As you can see, it shows you all traffic sources that match “google”, including 569 organic search visits and a few campaigns currently running.